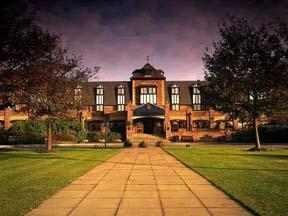 Choose from 67 hotels and guest houses in Lancashire. Shown below a just a selection of the hotels available. To search within an area please use the menu on the right. This homely bed and breakfast in the heart of Blackpool is only a short walk from North train station, shops, pubs clubs, theatres and the seafront. We pride ourselves on our food, friendliness and comfort. Get away from it all at the Lynmar, your home from home. We have the perfect place for those who wish for the comforts of home but without all the hassle, so that you can truly relax, put your feet up and enjoy your break or holiday. Blackpool has a vast array of attractions so that you can find something to do and a place to go no matter what your tastes are. Visit the famous tower, ballroom, winter gardens or the pleasure beach. For a great view of the Golden Mile, hop on one of the charming traditional trams and make your way along the seafront in style. Set amidst rolling parkland, this 19th century country house has been extensively refurbished to offer luxurious accommodation, whilst retaining an air of quiet elegance. Many visitors come to The Villa for its historic charm and splendid location, though they stay, and return again and again, for its warm hospitality and personal service. Situated in the picture perfect Lancashire village of Wrea Green, the hotel is just minutes drive from junction 3 of the M55. Kayley House offers contemporary apartments with free Wi-Fi and comfortable bedrooms. Preston railway station is a 5-minute drive away and there is excellent access to the M6 motorway. 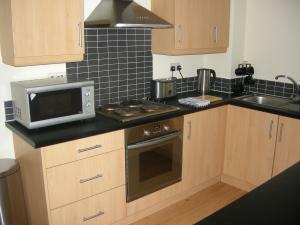 The 2-bedroom apartments feature a well-equipped kitchen, with a dishwasher, washing machine and microwave. There is a stylish lounge area, with facilities including satellite TV and a DVD player. The apartments are close to the Fishergate and St Georges shopping centres. A range of golf clubs are also within easy reach. Free parking is available. Ideally situated just a short walk from Blackpool's South Pier and the world famous Pleasure Beach, this small and friendly hotel offers comfortable accommodation in a fantastic central location. 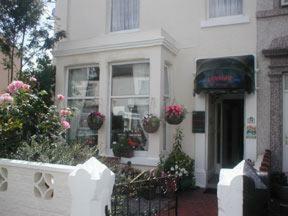 The Danescourt Hotel is a small to medium-sized hotel, owned and run by Lynn, Stuart and Andrew. Stuart and his wife Lynn have many years experience in the catering and leisure industry and Andrew is a qualified chef who has worked in many top hotels and restaurants. The hotel's team prides themselves on running a clean and friendly establishment, where all guests can be assured of the warmest of welcomes. The hotel's is a great location from which to experience all the fun and entertainment that this popular seaside resort has to offer. Its prime location, just off the promenade in the South Shore area of Blackpool, means that you are within walking distance of the Pleasure Beach, Sandcastle Water Park and casino. Catering for couples and families only, this guest house in central Blackpool is 10 minutes' walk from the central promenade, the Golden Mile, Blackpool Tower, Winter Gardens, and superb entertainment. Blackpool and the surrounding areas offer 9 golf courses, Stanley Park Golf being only a few minutes away and the nearest course to St Andrews. You will also find the famous Pleasure Beach, the roller coaster capital of the world, nearby for a day of entertainment. The city also has excellent shows, open all season. In the evenings you can sample a range of cuisine in the local restaurants, all of which can be found near St Andrews. In the centre of Lancaster, opposite the city's train station, this small, family-run bed and breakfast offers free parking, free Wi-Fi and charming, high-quality, affordable accommodation. Opposite Lancaster Railway Station and only 400 metres from the bus station, the Old Station House Bed & Breakfast has a great location. Lancaster Castle and the priory are just 3 minutes' walk away. Both of the city's universities, the grammar schools and all of Lancaster's hospitals are also within easy reach. Carefully preserved and sensitively refurbished, this historic building combines rich original charm and traditional character with modern comforts and facilities. All of the en suite rooms are homely, comfortable and individually designed, with TVs, hairdryers and tea/coffee making facilities. A delicious full English breakfast is included in the price and vegetarian alternatives and lighter continental options are also available. There is a large, floodlit, gated secure car park, with free parking for guests. Near the North Pier, this relaxed and homely hotel is close to Blackpools bars, pubs and nightclubs, a 5-minute walk from the town centre. The Syndicate superclub is just 5 minutes away, Club Sanuk is 2 minutes away and Funny Girls is at the end of the street. The Glenheath Hotel caters for everyone: families, singles, couples and parties. The hotel has a licensed bar and also sells Blackpool VIP Wristbands, which offer free or discounted entry and drinks at many of the towns bars and nightclubs. The hotel has received a Blackpool Accommodation Award for Quality and Cleanliness and has been accredited by the Blackpool Hotel and Guest House Association. 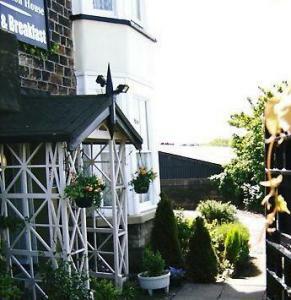 Less than 150 metres from Blackpool North Railway Station and just a short walk from the North Pier, this small, privately owned hotel offers free Wi-Fi and comfortable, great-value accommodation. 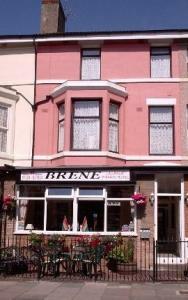 The Brene Hotel has a good location, within easy walking distance of the Funny Girls burlesque cabaret show bar and close to all that Blackpool has to offer. The beach, Blackpool Tower and the theatres are just 5 minutes' walk away, as are the shops and nightlife of the town centre. 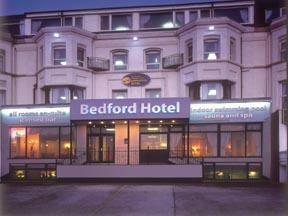 The hotel offers a range of accommodation to suit the needs and budget of any traveller. En suite rooms and rooms with shared bathroom facilities are available. All rooms are fully central heated with TVs, freshly laundered towels, tea/coffee making facilities and free Wi-Fi. A substantial breakfast is served in the newly refurbished dining room. There is also a comfortable and friendly bar offering a range of hot and cold snacks. This magnificent Georgian building has a beautiful, peaceful location, above an 18-hole championship golf course. The hotel also offers superb leisure facilities, including an 18-metre indoor pool. Rich in beautiful original features and lavish furnishings, Shaw Hill offers the tranquillity and comfort of a superb country house hotel, with friendly and attentive service and fabulous views overlooking the golf course. 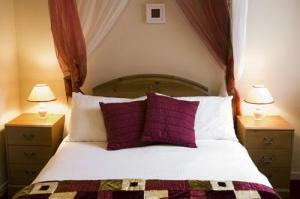 There are 30 beautifully appointed and individually decorated rooms of 3 varying standards. All of the en suite rooms have TVs and tea/coffee making facilities. The award-winning Vardon's Restaurant offers the finest cuisine, made with fresh, locally sourced produce. The impressive leisure facilities include a fully equipped, state-of-the art gym, a steam room, a sauna, a jacuzzi and the pool. Also located on the premises are beauty treatment rooms, a hair salon and a sports therapy clinic as well as a selection of the finest complementary medicines. Located just a few minutes from the Pleasure Beach, Windsor Hotel has been graded 3 AA Diamonds and offers excellent standards of accommodation. Ideally situated in the South Shore area, some rooms boast stylish four-poster beds for that special treat. Windsor Hotel is family-run, ensuring that personal touch. All rooms are en suite and modernly furnished. We are close to all of Blackpool's attractions. Boasting a prime seafront position on Blackpool's New South Promenade, this hotel with extensive gardens is a short journey from Blackpools hustle and bustle. With a restaurant and sun lounge, the hotel offer 42 en suite rooms, most of which are front-facing, and some of which have a balcony. Whilst on the quieter side of this bustling resort, the many varied attractions for which Blackpool is famous are only a short bus or tram ride away. The bus and tram stops are opposite the front door. The Pleasure Beach, Waterworld and South Pier are a 5 minute walk away. You could use The Headlands as a base to visit Lytham St Annes, Cleveleys and the markets at Fleetwood, or explore the beautiful Rural Fylde Villages and the Lake District. Wireless internet is available at The Headlands. Allun and Sue are pleased to welcome you to their hotel, situated close to the centre of Blackpool and with the golden sands of Blackpool beach also nearby. If the hustle and bustle of the promenade is too much, a 10-minute stroll will take you to the middle of Stanley Park, amid its beautiful gardens, cafe/restaurant, boating lake and children's attractions, including the famous Blackpool Zoo. All rooms at Chelston Hotel are clean, centrally heated, well presented and come with a television, towels and tea/coffee making facilities. DVD players, hairdryers and ironing boards are all available on request. The full breakfasts are sure to set you up for the day. Now under new management and having recently undergone a major refurbishment, this 3-star hotel offers superb panoramic views of Queen's Promenade and the Irish Sea. With its internationally recognised 3-star rating as your assurance of its superior quality, the Chequers Plaza Hotel is a luxurious option for a stay in Blackpool. The hotel is situated on one of the most attractive seafront locations in Blackpool, the Queen's Promenade, away from the noise and the crowds and yet close to most of this vibrant seaside resort's main attractions. The great sea views and comfortable well- equipped en suite accommodation fully justify the hotel's 3-star rating. Conveniently located just a 5-minute drive from Blackpool town centre, the hotel offers excellent cuisine, a 24-hour bar, night security, a lift and a car park. Friendly, experienced staff will ensure your stay is a memorable one. 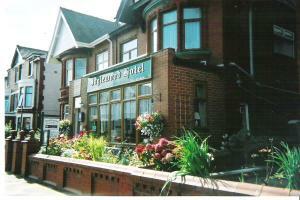 The Hotel of the Year 2005 - Silver Winner from Blackpool Tourism and Three Diamonds awarded by English Tourism Council. These are a sign of our first class standards and friendly service. Awarded Three Diamonds by The English Tourism Council. 50 yards to the sea front. 500 yards to Funny Girls, The North Pier, pubs, clubs, restaurants, shops, town centre, bus and train stations. 700 yards to The Winter Gardens and Blackpool Tower. Short tram ride to The Pleasure Beach. We are continuously complimented upon our friendliness, cleanliness and food. 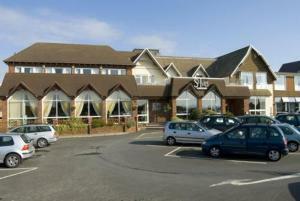 Lancashire's best kept secret, the Leyland Hotel boasts the finest hotel facilities in the area. Part of the award winning Feathers Group, this designer hotel exceeds all expectations. Preston's leading hotel is situated in a peaceful nook just off of junction 28 of the M6 and is the perfect location for an overnight stay, professional conference or meeting. We are very near to Blackpool, Southport and Camelot Theme Park. We are in a perfect location if you like shopping, as the Trafford centre, Manchester, Liverpool and Cheshire Oaks are only 30 minutes drive from ourselves. The Feathers Group have completed a multi-million pound refurbishment programme, which has created wonderful public areas, an award-winning restaurant, magnificent health spa and contemporary executive bedrooms. We have special rates available for the Grand National weekend. 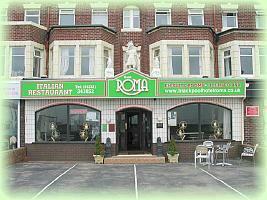 We are 20 minutes drive from Aintree Racecourse and just on the edge of the M58 motorway. Occupying a peaceful position on the outskirts of Blackpool, this charming property offers a relaxing retreat, whilst being within easy reach of the bustle of the town centre and all it has to offer. While away your time in the tranquillity of the hotel's surroundings, or take advantage of the excellent facilities. The indoor leisure club is the best around with a 21-metre pool, sauna, steam room and spa bath. And for pure indulgence, why not pay a visit to the hotel's beauty salon? The perfect base to explore the Lake District and the nearby Trough of Bowland, during your stay you can also check out the golf centre, not to mention the championship course designed by Peter Allis with 12 holes over water. A very warm welcome awaits you at the Kenilworth Hotel. We are fully licensed and all our rooms have en suite facilities. We are situated on the select New South Promenade, just far enough away from the bustle of Blackpools' famous Golden Mile yet close enough to be handy for all the seasonal shows, entertainment and amusements. Enjoy a stroll along our beautiful, newly created Promenade which leads to the fabulous Pleasure Beach, Sandcastle Waterworld and casino.